The Mi806 pH/EC/TDS/Temperature Meter is ideal for a variety of field applications including agriculture, fish farms, wine-making, pharmaceuticals, wastewater treatment plants, and environmental studies. Gives quick, accurate readings. Features Hold function to freeze readings for easy and accurate recording. Includes hard case, probe, connection cable, and 9V battery. Also includes two 20mL packets each of pH 4.01 calibration solution, pH 7.00 calibration solution, 1413µS/cm calibration solution, and electrode cleaning solution. 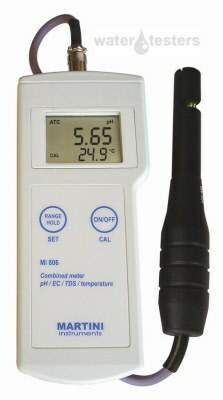 (Higher EC/TDS range than Mi806) Measures Electrical conductivity and Total dissolved solids and pH. For drinking water measurement and aquariums. Portable 4 in 1 meter pH/EC/TDS/Temp, range 0.00 to 14.00 pH, 0.00 TO 20.00 mS/cm, 0.00 TO 10.00 ppt, 0.0 TO 60.0 °C, resolution 0.01 pH, 0.1 mS/cm, 0.01 ppt, 0.1 °C, accuracy (AT 25 °C) ± 0.01 pH, ± 2% FS, ± 0.5 °C, typical EMC deviation ± 0.01 pH, ± 2% FS, ± 0.5 °C, Automatic Temperature Compensation, pH calibration in 1 or 2 points with automatic sample recognition, EC calibration: automatic in 1 point, supplied with MA851D/1 amplified probe, a 9 V battery.